Often simple encouragement can be of benefit to yourself or others you come in contact! Here are some encouraging scriptures about simple support. Simple Encouragement From Billy Graham! 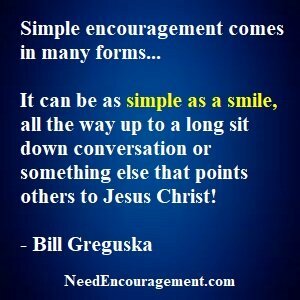 How Often Do You Experience Simple Encouragement? Keep it simple with simple encouragement! The point he was trying to make to me when I was a kid, was that there are times when things are going to be going well for us and that there are times when things are not going to go as well. I have learned to be thankful for the good times, and to find contentment in the harder times. Explain what the Romans Road to salvation is? The statement “He who has ears to hear” mean what? Simple Encouragement From The Book Of Job! Just think a moment of all the difficulties you have been through in your life, (relationships, school, work, marriage, financial, physical, emotional) to name a few, but you are still alive and striving to make a new start for yourself. Sign up to get on my email list and receive inspirational emails. Feel free to call 800-633-3446 24 hours a day, to talk to a trained Christian counselor who can be an encouragement you or someone you know! Make it a goal of yours to pray each day alone, just you and God talking. Reach Out To Others With Simple Encouragement! First of all, begin to enjoy your time with God in the Bible, even if it is just for a minute or two to start off, you will find it so helpful, you will begin to look forward to reading as a regular part of your day as a source of wisdom and direction. Click here to watch this encouraging video to learn how to share what God has done in your life, with others who God puts in your path. Watch this video for encouragement, and also watch this video about why God allows suffering? Check out websites that are full of excellent information. Help encourage others with some outstanding acts of kindness ideas. If you like this site, tell your friends and bookmark us! Make sure you get enough rest and exercise, plus be sure to eat healthy foods. Try to get more balance your life, get out and try to do something fun to get your mind off of your problems, consider calling a friend. A significant number of people have had negative experiences with “Religion” in the past, but this website is based on the inspired word of God, and it is non-denominational. You do not need to work your way to heaven. In trying to help lift someone up even if you are struggling, you will discover that it is like putting cologne on someone, you can not help to get some on yourself. Also, remember that you can’t help a person uphill without getting closer to the top yourself. Often people dwell too much on their problems and troubles which only makes their problems more significant! Be thankful for what you have, even to be able to acknowledge that whatever you are going through, you will get through it in God’s time. Do not let yourself dwell on negative things because they will drag you down to a place you do not want to be. In trying to encourage others even if you are feeling a little below par yourself, you will reap a benefit that does not necessarily make sense, but you will discover to be true! Simple Encouragement Through The Eyes Of Children!